This section includes wall-mounted rails, floor to ceiling rails, modular rail systems, bath fixed rails and grab rails with non-standard features. Before making a choice, a person needs to be clear about the function of the rail. Some of the rails will be included in several sections due to their design. The most important thing to determine is the task you want the rail to perform. For example, is it pull up from a sitting position? Is is to steady yourself on one leg as you step into the bath? Many times the rails are used with different types of equipment. 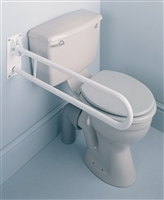 Click this link to read further information on installing grab rails in a bathroom. It is recommended that a full assessment is made by a trusted assessor or occupational therapist to ensure they grab rails are used safely or whether an alternative solution is required. Click this link to read more on occupational therapy and how to obtain an assessment.